In the BIO-DIRECT initiative at the Norwegian Veterinary Institute, the goal is to develop a future-oriented veterinary diagnostics that can detect disease quickly and accurately by using new biomarkers and establishing organ-like cell models that can minimize animal experiments. Establishing and characterizing new fish cell lines will be an important basic activity in the strategic institute initiative BIO-DIRECT. 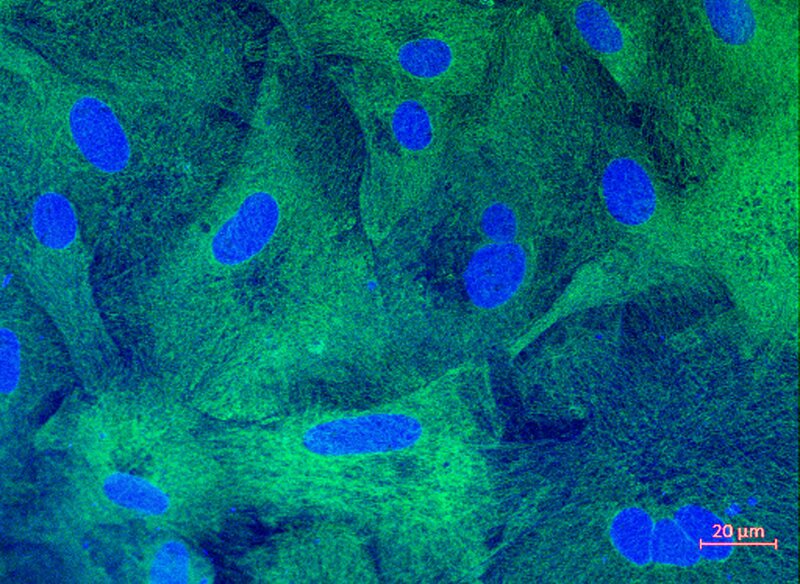 The picture shows epithelial cells from Lumpsucker fish brought through the Institute's initiative on cell cultures associated with in-vitro methods (3R). »Photo: Hilde Sindre and Anita Solhaug, the Norwegian Veterinary Institute. Biomarkers can be translated into "biological indicators" released from internal organs by disease and injury. Today, there is a lack of suitable biomarkers for illness in many animal species, and one of the goals of this project is to increase the biomarker repertoire and thus the information that can be obtained from diagnostics for fish and animals. Also, the initiative will contribute to a quicker diagnosis with new measuring methods that look at many factors in one and the same analysis. The project will also develop organ-like cell models that can enable research on disease mechanisms, immune function and environmental impact without using experimental animals. In BIO-DIRECT, the Norwegian Veterinary Institute will develop a diagnostics that is mainly based on samples from blood, mucus, and stools. Through changes in the molecular composition (biomarkers) in these samples, one can find out much about the animal's state of health. –The goal is to meet the need to investigate new and unknown diseases faster and to discover how the environment can have health consequences, says project manager Maria K. Dahle. She explains that diagnostic analyses based on biomarkers require the development of new methods suitable for measuring many markers quickly in the same sample, so-called multiplexing of assays. - Biomarker-based diagnostics also require thorough validation. To reduce the number of experimental animals for this work, we need good alternative biological models. These are organ-like models made up of cells, also called organ-on-a-chip, which are artificially produced organs on a chip that can reveal the harmful effects of microorganisms and environmental factors. With such pieces one should be able to simulate some of what is happening in organs or in parts of organs, she says. The BIO-DIRECT initiative will build an internal technology platform that includes methods for identifying biomarkers, developing tools for measuring them, and establishing multiplex analyses. Besides, one will test cell models and create new ways to measure immune function. The project has five work packages, and 20 researchers from the entire institute are involved. A large group is working on the strategic institute initiative BIO-DIRECT at the Norwegian Veterinary Institute. Photo: Astrid Bjerkås, Norwegian Veterinary Institute. The Norwegian Veterinary Institute's most important function is emergency preparedness and competence development to avert health threats to fish, animals, and people. Diagnostics are a foundation in this work. Therefore, it is vital that we keep up with time and develop new technology, Dahle says. At the Norwegian Veterinary Institute, we have a good basic knowledge of the state of health and the response to the disease in the different animal species and have right conditions for developing the most informative analysis tools, she concludes. The investment has been allocated NOK 12 million in the period 2019-2022. 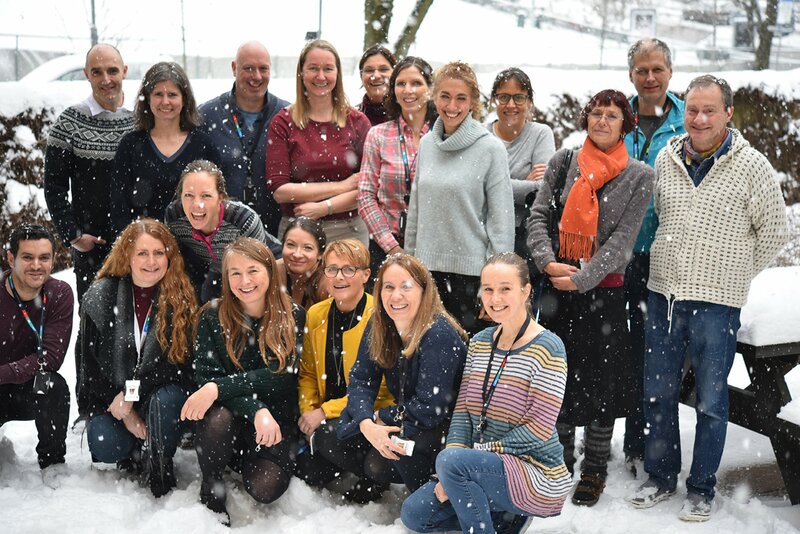 Collaborative partners are the Norwegian University of Life Sciences, the University of Oslo, the University of Norway's Arctic University and the Norwegian Institute of Public Health. Financing source: Norwegian Research Council (NFR) basic grant - strategic institute initiative (SIS).